The universally famous make up line named after the mastermind and beautiful face that brought it to the world is all everyone can talk about these days. Why? For one thing, the product fills a void felt by many makeup users of deeper, darker complexion. The make-up line boasts a collection of 40 tones from 100 to 470. The singer has been meticulously overseeing the development of the line, prioritizing its wearability, ensuring that makeup users are encouraged to be creative and unique in using the products. How does she get that message across? Well, the make-up speaks for itself. 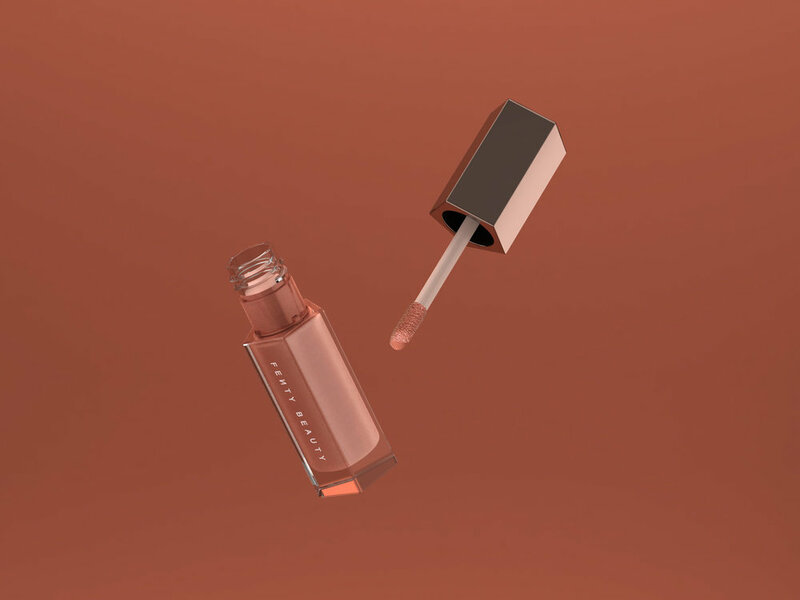 Reviews are stellar and Fenty Beauty is on its way to being in the dictionary along with bootylicious, yowza, and NSFW, but before the makeup can speak for itself, the packaging beckoned shoppers to pick up the tubes and packs up off the shelves. Fast. Geometric shapes have really taken over. Just look at the trending geometric tattoos, makeup designs, display cases, etc. Following suit, some the Fenty Beauty line seems to mimic the honey comb. The latest line of cosmic gloss screams “pick me up!” with its rainbow psychedelic packaging giving a hint of the sparkle held inside the package. Still, other products build the suspense with an opaque container giving just enough of a teaser to entice but not enough to satisfy. You have to buy to satisfy. Also, Rihanna has made herself a walking billboard for her makeup. If there is a product that will make women look remotely as flawless as Rihanna, we’re pretty sure people will do whatever it takes to get it - even stalk the nearest Sephora until they restock their favorite item. Kylie Jenner recently introduced via social media a preview of her upcoming Valentine's Collection for Kylie Cosmetics. The dynamic launch includes a fierce look, thanks to its vibrant packaging. It features the iconic Kylie lip-drip logo but dazzles in red glitter. Kylie never seems to disappoint her fans. The Be Mine Valentines Collection has already sold out, just like past limited editions including the Birthday Collection, Holiday Collection and KoKo Kollection. What makes us a huge fan of Kylie’s is how marketing and packaging combine to create perfection and stirs up a frenzy where consumers anxiously wait for their parcel to arrive on their doorstep. Creating a look and establishing a brand blended with the right packaging is essential to a successful product launch. In Kylie’s case, we think she does an amazing job with her line of cosmetics. Keep up the flawless look. McDonald's appears to be adopting the adage and announced today that it has given its packaging a modern makeover -- forgoing the familiar red, white and gold motif and replacing it with bold colors. This month, the biggest fast food chain in the world is rolling out new carry-out bags, fountain beverage cups and sandwich boxes at its restaurants in the U.S., McDonald's said in a news release today. The latest look -- featuring colorful accents and bold typography -- will also expand to over 36,000 restaurants worldwide throughout the rest of 2016, the company said. "McDonald’s is a fun and modern brand and this was a progressive way to turn our packaging into art and support a community where fashion is an expression," said Matt Biespiel, senior director of Global Marketing, according to the news release. McDonald's global packaging is pictured through the Years 1955-2016. "Every day 69 million customers visit McDonald’s around the world and this new packaging will be a noticeable change," Biespiel said. "It was fun to join these ideas together and create playful pieces that connect our customers to the Brand." McDonald's added that the new look is not only stylish but sustainable. To celebrate the unveiling of the new packaging, two students from Miami International University of Art and Design created an original "couture collection" of "one-of-a-king accessories" under 48 hours using 50 bags, 72 straws, 22 cups and eight sandwich boxes with the new packaging. Packaging Equipment available from GTI Industries, Inc.